Marketplace Bakery’s music-making duo now do their baking in Longmont, but you can find their bread at In Season Local Market in Louisville! Grab some at 924 Main Street, 303.325.7614. Old Town Cinema presents the award winning movie Rock Prophecies 7:30 pm, Sunday, January 30th at Waterloo. Come early for Happy Hour. Stay late for a Q&A with Boulder Rock photog Lisa Siciliano. January markdowns are happening weekly at Downtown’s cool boutique! 35,000 visitors in 2010. When Google Analytics dropped that number in front of the Louisville DBA, we felt it was time to give our visitors, and businesses, a better online experience. Starting with a new URL – DowntownLouisvilleCo.com (formerly louisvilledba.com). The site has been retooled to be more intuitive and business-friendly. But don’t take our word for it, come see for yourself! 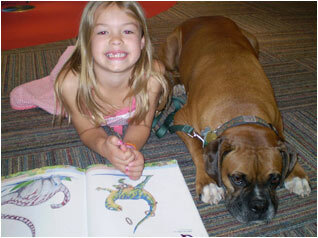 Six year old Julianna Knoll takes a break from reading to December’s DDotM, Bill the Boxer, at the Louisville Public Library. Bill, owned by Chrissy Messick, is a certified therapy dog and part of the library’s Read to Rover program. Bill visits the LPL so that children who may not be comfortable reading out loud in class or to their parents can have an accepting and nonjudgmental audience. We believe there is no truth to the rumor that Bill’s favorite book is The Cat in the Hat. Anthony Grant presents his new work and work by photographer Jim Shugart. Bittersweet Gallery will stay open late on the 7th. Come check out our remodel! Join Mountain High Appliance at WinterSkate Saturday, January 15, 2 to 4pm. Chef Julie will be assisting young and old alike. Come bake some cookies and enjoy hot cider and other drinks!